NEW YORK — The once-heralded blood-testing startup Theranos is shutting down, according to a media report. Theranos was unable to sell itself and is now looking to pay unsecured creditors its remaining cash of about $5 million in the upcoming months, according to an email The Wall Street Journal obtained that CEO David Taylor sent to shareholders. The announcement comes nearly three months after Theranos founder and former CEO Elizabeth Holmes and former Chief Operating Officer Ramesh Balwani were charged with criminal fraud. Prosecutors allege Holmes and Balwani deliberately misled investors, policymakers and the public about the accuracy of Theranos' blood-testing technologies going back to at least 2013. If convicted, they could face prison sentences that would keep them behind bars for the rest of their lives, and total fines of $2.75 million each. Holmes, once considered a wunderkind in Silicon Valley, had pitched Theranos' technology as a cheaper way to run dozens of blood tests. Holmes said Theranos had discovered a new way of doing blood testing, one able to do dozens of tests with just a prick of a finger and few droplets of blood. A notoriously secretive company, Theranos shared very little about its blood-testing machine, nicknamed Edison, with the public or medical community. Holmes said she was inspired to start the company in response to her fear of needles. She carefully crafted her image as well, wearing almost entirely black turtleneck sweaters that earned her the moniker in Silicon Valley as "the next Steve Jobs." Investors bought what Holmes was selling and invested hundreds of millions of dollars in the company. At one time, Theranos was worth more than $10 billion and Holmes was the youngest self-made female billionaire. 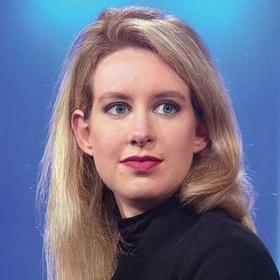 But an investigation by The Wall Street Journal two years ago found that Theranos' technology was inaccurate at best, and that the Palo Alto, California-based company was using routine blood-testing equipment for the vast majority of its tests. The story raised concerns about the accuracy of Theranos' blood testing technology, which put patients at risk of having conditions either misdiagnosed or ignored. The Journal's investigation marked the beginning of the end of Theranos. Walgreens ended its blood-testing partnership with the company, and the Department of Health and Human Services effectively banned Theranos in 2016 from doing any blood testing work. The Securities and Exchange Commission brought civil fraud charges against Holmes and Balwani in March. Holmes settled with the SEC, agreeing to pay $500,000 in fines and penalties. Balwani is fighting the charges. Theranos laid off most of its staff earlier this year.